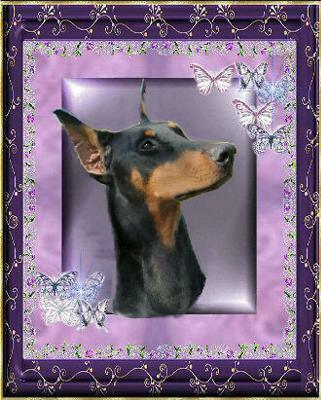 Breeders of Champion Dobermans in Canada and the US. 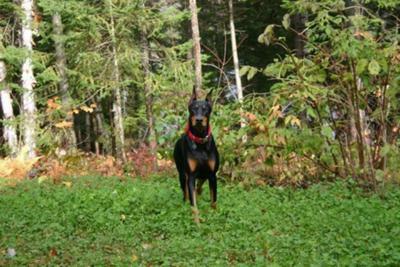 From our first home-bred Champion, more than 20 years ago, our love affair with Dobermans has not decreased. We have now more than 95 Canadian and over 7 American Champions, some with several BIS/BISS in Canada and one with both those titles in the United States. To top it all we also have several dogs with titles in obedience and in Agility. 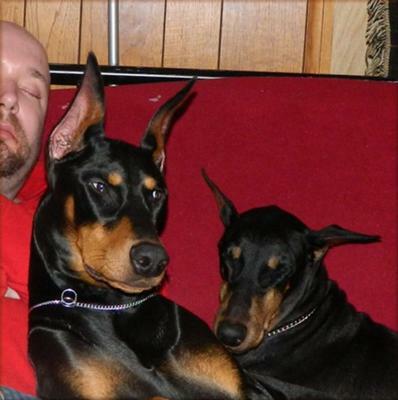 Our dogs have been the foundation of many new Doberman breeders in Canada and the USA. We breed to get the best disposition, health and good looks that we can. We believe in pedigree breedings, and to date we have had really great success with this method. We have no kennel as all our dogs live with us in our house. They are well adjusted, happy, outgoing dogs that enjoy company and play. All dogs have pertinent papers which prove their Championship and achievements. We occasionally have puppies and older adults available. Serious inquiries only. References are required to get a puppy from us or a visit to our home, no exceptions. All of our dogs are health tested. "Where Quality is a Tradition"
Nous sommes québécois et parlons francais.